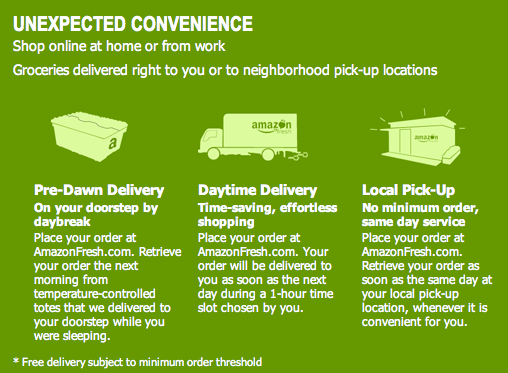 Check out Amazon Fresh – a new invite only service from Amazon that looks eerily similar to the quintessential 90’s Internet flameout, Webvan. The new service promises speedy at-home delivery of groceries, including fresh produce, at “competitive everyday prices.” It’s available only in Seattle currently, and has not been officially announced. But at least one person caught a glimpse of an Amazon Fresh truck driving around downtown Seattle. Users select and pay for groceries on the site. They can then choose to pick up the items themselves locally, or, with a minimum order size, have them delivered next day within a one hour time slot. Groceries will also be delivered to doorsteps pre-dawn in a temperature-controlled container. A year ago Amazon began experimenting with sales of non-perishable food and household items, but did not deliver them directly and perishable goods were not available. If you are a Seattle reader, keep your cameras handy. We want a picture of the delivery truck. Webvan, which had a spectacular IPO and quickly expanded to 26 cities, went bankrupt in 2001. Before closing down, Webvan had acquired competior HomeGrocer. Coincidentally, Amazon was an investor in HomeGrocer.